This pumpkin French toast makes a fabulous fall breakfast. 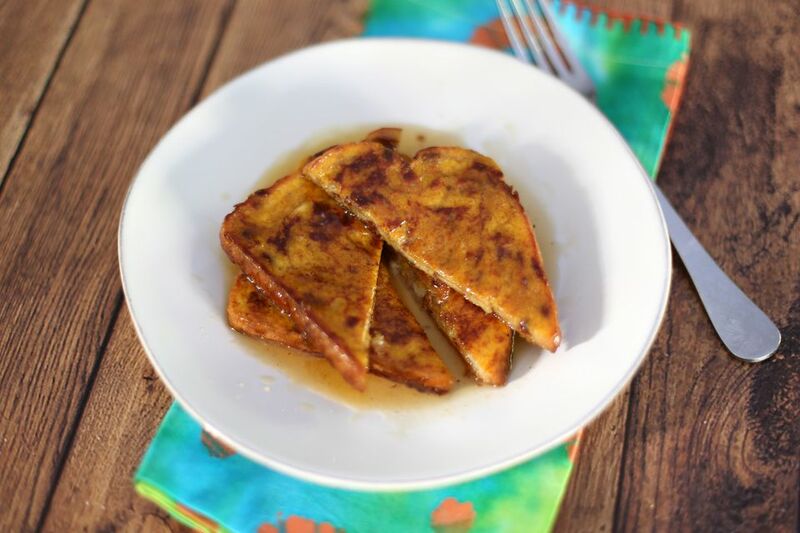 The French toast is perfectly spiced, with just enough pumpkin to make it moist and flavorful. The pictured pumpkin French toast was made with cinnamon swirl bread, but raisin bread, challah, or a rich brioche bread would be excellent choices as well. Or make it with a plain white or wheat bread. The apple cider syrup is just amazing on this French toast, but if you're short on time, use maple syrup or a golden cane syrup. Serve this pumpkin French toast for a special fall breakfast, a weekend brunch, or holiday morning breakfast along with sausages, ham, or bacon. The syrup thickens more as it cools, so transfer it to the refrigerator to cool quickly or make it the day before or a few hours in advance. When the butter stops foaming, add the apple cider, brown sugar, and cinnamon sticks. Bring to a boil, stirring. Continue cooking over medium heat, stirring frequently, until reduced by half to about 1 cup or slightly more. This will take about 15 minutes. Heat a warming drawer or oven to 200° F. This is to keep cooked French toast warm while cooking batches; if you are serving the pumpkin French toast as you cook it, skip this step. In a medium bowl, whisk the milk with the pumpkin, eggs, 1/2 cup of brown sugar, vanilla, 1 teaspoon of cinnamon, and nutmeg. Pour the pumpkin mixture into a wide, shallow bowl. Heat a griddle or large nonstick skillet over medium-low heat. Coat the pan with a few teaspoons of butter. Soak a 2 to 4 slices of bread (depending on the size of your griddle) in the pumpkin mixture for a few seconds, turning to coat both sides. When the butter is foaming, arrange the soaked bread on the griddle. Cook the soaked bread until browned on the bottom. Turn and brown the other side. This will take about 2 to 3 minutes on each side. Transfer to a shallow lightly buttered or a parchment paper-lined baking sheet and keep warm in the oven while cooking the remaining French toast. Serve with the cider syrup, maple syrup, golden cane syrup, or your favorite. Depending on the size and thickness on the bread, you should get anywhere from 8 to 12 slices or 4 to 6 servings. Pepperidge Farm Cinnamon Swirl Bread is a relatively small loaf and will make about 12 slices of pumpkin French toast (as shown in the photo).